Announcing our NEW Digital Edition! Simply Click on the animated image on the left to log in (or view a FREE demo) of the new Tobacco Products International DIGITAL EDITION - with full editorial content, searchable articles, and lots of exciting new features for our subscribers! A look back at EuroTab 2009 and announcing EuroTab 2010. If the US embargo of Cuba ends, it will have implications around the cigar world. 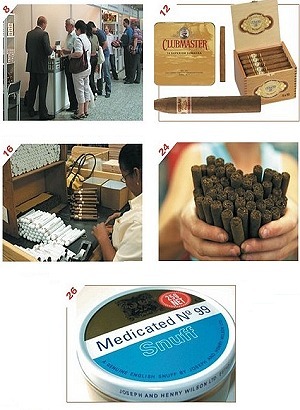 A look at one of the world�s true tobacco Titans. A look at Snus possibly making their way into the European Union, and how packaging may be the key to their success. Tobacco Products International is published by Lockwood Publications, Inc., 26 Broadway, Floor 9M, New York, NY 10004 U.S.A., Tel: (212) 391-2060. Fax: (1)(212) 827-0945. Printed in the U.S.A.. HTML production and Copyright © 2000 - 2009 by Keys Technologies and Tobacco Products International Magazine. All rights reserved.